Roll out in small amounts into 1/4" thickness. Fill with about a 1/2 tsp of filling (see below for recipes). Bake for 20-30 minutes at 3500 or until browned. The baking time depends on the diameter of the hamentaschen. 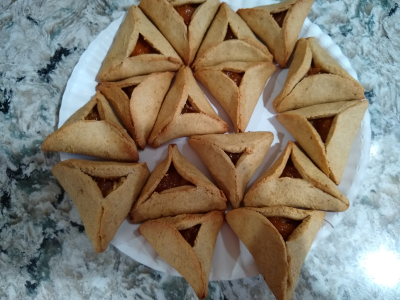 Hamentaschen from 4" diameter circles baked for 20 minutes. Cook apricots with water until they are soft. Add part of the sugar and cook over low heat for 10 more minutes or until soft. Taste. Add more sugar if necessary. Soak prunes in hot water several hours or overnight.